Nothing much ever happens in Millville, a small, secluded Middle-American community—until the day Brad Carter discovers he is unable to leave. It’s not just the nearly bankrupt real estate agent who’s being held prisoner; every other resident is also being confined within the town’s boundaries by an invisible force field that cannot be breached. As local tensions rapidly reach breaking point, a set of bizarre circumstances leads Brad to the source of their captivity, making him humanity’s reluctant ambassador to an alien race of sentient flora, and privy to these jailers’ ultimate intentions. But some of Millville’s most powerful citizens don’t take kindly to Carter’s “collaboration with the enemy,” even under the sudden threat of global apocalypse. Decades before Stephen King trapped an entire town in Under the Dome, science fiction Grand Master Clifford D. Simak explored the shocking effects of communal captivity on an unsuspecting population. 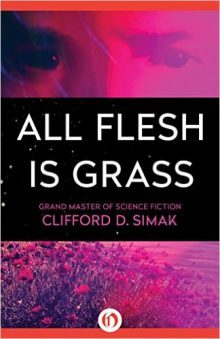 Nominated for the Nebula Award, All Flesh Is Grass is a riveting masterwork that brilliantly reinvents the alien invasion story.